(leading to ExpertRating ESL/EFL Teaching Skills Certification). This course includes a knowledgeable and caring instructor who will guide you through your lessons, facilitate discussions, and answer your questions. The instructor for this course will be Dr. Tom Scovel. About the ExpertRating Online ESL Teaching Course instructor : Dr. Tom Scovel is a professor at San Francisco State University, where he teaches courses as diverse as ESL Grammar and Psycholinguistics. Scovel was born and raised in China and attended high school in India before going to the United States for his university education. His research and teaching interests focus largely on language pedagogy, psycholinguistics, and second language acquisition, and he has published and spoken widely in these areas, including the text Learning New Languages. In his free time, Scovel enjoys being with his grandchildren and training for triathlons. An Introduction to Teaching ESL/EFL Certification requirements: For taking this instructor led ExpertRating Online ESL Teaching Course you need Internet access, e-mail, and the Microsoft Internet Explorer or Mozilla Firefox Web browser. "I am glad to have taken this course, it will be helpful for my personal improvement and for my job." "I especially liked the chance to take this course at my own pace, since on some Wednesdays and Fridays I was away from the computer or busy with other tasks…Since the environments where I am most likely to be teaching in the future will have Internet access and use it extensively, I valued the website references during the later lessons of the course. From what I could tell from the discussion area, we were a rather heterogeneous class--it was great to get perspectives from non-native English speakers who are teaching English, as well as from English speakers from both the U.S. and other "inner circle" nations....I am very appreciative of the teaching assistant who always tried her best to discuss with me, and I am very glad I joined this course which I'd like to recommend to others." "I have quite [extensive] experience in teaching ESL/EFL English, and I must say that this course was excellent. Also, I take this opportunity to strongly express my sincere recognition to my instructor Tom Scovel, for his excellent job. Thanks, Mr. Scovel for sharing with us your knowledge and experience. Be sure that everything you taught will be of tremendous help for us as ESL/EFL Teachers." "I like the course. It was good and I am going to recommend it to my friends. The instructor was good and the explanations were clear and direct. The teaching assistant was excellent. She had patience with all of us and she gave us a rewarding comment when it was necessary." "I'm really delighted with this course and the way it was structured: Easy-to-follow. Thus, I didn't feel frustrated at anytime.... THANK YOU FOR EVERYTHING! I'm sure it would be helpful to apply in my professional life." "I really enjoyed this course because it was useful and fun. The instructor helped me a lot." "I took this course because I frequently get students who have English as their second language and I wanted some insight. Thank you for providing that insight." "I very much enjoyed this course. I feel that I gained many useful tools and approaches for use in my classroom. Thank you very much for sharing your knowledge with us." "Thank you for this comprehensive and enjoyable course. Thanks to the TA for her patience, tact, and expertise in the discussion area. I hope there'll be a subsequent course." "The course was very interesting and written in an easy to understand style with good illustrations. I really appreciated the bibliographic material and the extra readings and sites provided at the end of each module." "The supplemental materials and list of recommended sources for further study are a goldmine. I usually take the course and then go back over the lessons and materials a second time to incorporate all the "stuff" that is provided. Thanks." ExpertRating is one of the world's only ISO 9001:2015 Certified companies (from TUV America) offering an Online ESL Teaching Course (leading to ExpertRating ESL Teaching Skills Certification). When you choose the ExpertRating Online ESL Teaching Course you can be sure that you are buying a premium International certification that is recognized by hundreds of employers and Government bodies in the US and other countries. With ExpertRating you get certified quickly online and you are equipped with a store house of information through the in-depth ExpertRating Online ESL Teaching Courseware which has been developed by experienced International Language Experts. The ExpertRating ESL/EFL Teaching Skills Certification is by far the best value for money instructor led ESL Teaching Program at $129.99. How much does the ESL Teaching Certification cost and what does it include? You can buy this ExpertRating Online ESL Teaching Course leading to ESL Teaching Certification at a special offer price of only $129.99 which includes the in-depthExpertRating Online ESL Teaching Courseware and exam fee. 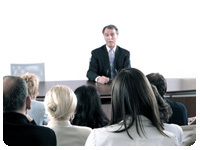 This is the best value for money ESL teacher certification Program available till date. You get the following services within the USD $129.99 fee. In-depth ExpertRating Online ESL Teaching Courseware including scenarios and case studies. World wide airmail delivery of the hard copy ESL Teaching Certificate. 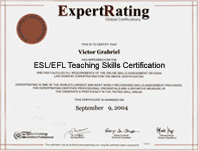 The ESL Teaching Certificate can be used to prove your certified status and does not mention the words "online". The process of getting yourself certified is very simple. All you have to do is buy the ExpertRating Online ESL Teaching Course for $129.99. Log in to the instructor led course using your password. Go through the ExpertRating Online ESL Teaching Courseware (which would take you 6 weeks) and complete the final ESL Teaching Certification exam at your convenience. You can complete the exam within 2 months of buying the ESL Teaching Certification. The result of the exam appears as soon as it is completed, and your ESL Teaching Certificate is mailed immediately. Chapter assignments to help you practically use the ESL Teaching Skills that you will learn during the ESL teacher certification Course. The final exam is fully based upon the ExpertRating Online ESL Teaching Courseware that is provided along with the ESL Teaching Certification. If you have gone through the courseware properly you should not have a problem clearing the exam. The exam consists of multiple choice questions from all chapters of the ExpertRating Online ESL Teaching Courseware. International travel opportunities, multi-cultural training, and job satisfaction are some of the many benefits of becoming an ESL/EFL teacher. ESL/EFL is essential for those people who either live in the US or the UK. However, this fact can also not be denied that the number of English learners is increasing by the day. 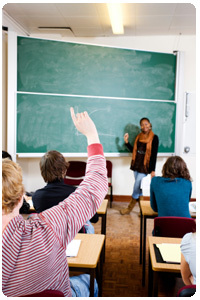 Teaching English as a second language is an interactive, interesting, informative and fun. It can be carried out as a hobby, for charity, as a part time job or on a voluntary basis. The ExpertRating ESl/EFL course brushes up your grammatical skills, your knowledge of tenses and some basic rules of English that are required to teach English as a second language. EFL or English as a foreign language and ESL or English as a Second Language is usually taught full-time over a one-month period or part-time over a period up to a year. The ExpertRating Teaching ESL/EFL Certification will provide you tips on grammar, pronunciation, listening, speaking, reading and writing and learn the nuances of becoming a successful teacher. The English language is everywhere—in music and movies, classrooms and airports, newspapers and e-mail. It's the language of both Shakespeare and Hollywood. So everyone knows what English is . . . or do they? Is it British, American, Canadian, or Australian? Is it harder to learn than other languages? In the first lesson, you'll explore the native vs. non-native distinction people often make about English speakers. You'll also look at how teaching English is different from teaching other subjects. And finally, you'll see which aspects of memory are most helpful in learning a language. As an English teacher, you naturally want to choose the most appropriate materials and activities for your classroom. But how do you do this? First, you must answer the most important question of all: Who are you teaching? In this lesson, you'll think about the faces you see every day in your classroom. Are they younger or older? What life experiences and intellectual abilities do they bring with them? Why do they want to learn English? All these variables will impact how you teach, shaping your approach and the activities you choose. One thing's for sure: It's really not English you're teaching, but students. In this lesson, you'll take a look at some of the many methods people have used over the years to teach foreign languages. Some are hundreds of years old, while others are fairly new on the scene. As you'll see, though, all of them suffer from certain limitations. Are they useless then? Not at all. In this lesson you'll explore how, even though the methods themselves may not help much, one can still gain a lot from understanding the ideas that led to their creation. If methods are too limiting, what can you use to guide you in your teaching? This lesson will focus on general principles that can guide your choice of classroom activities whatever your situation may be. You'll learn about Communicative Language Teaching, as well as a number of principles that experts have developed along the way. Of course, you're not limited to what others have done. Instead, you'll discover ways to select or even develop your own principles. And you'll find the freedom to choose the principles that are relevant to your teaching situation and let go of those that aren't. How does one define what a word is? By its spelling? By its pronunciation? By its dictionary meaning? As teachers of the English language, words are your stock-in-trade. You must teach vocabulary, because a language is made of its words. But you can't really teach the true meaning of words if you teach them in isolation and out of context. This lesson will look at several types of meaning you need to be aware of and explore some techniques for teaching vocabulary items in the most helpful way. No other aspect of language teaching is more misunderstood and disliked than grammar! Like it or not, though, grammar is the linguistic glue that holds words together. In this lesson, you'll look at interesting ways to teach grammar, including using listening, the lexical approach, the top-down approach, and context. These approaches will not only be useful and relevant, but they might even make grammar exciting for your students to learn! Listening and speaking come so naturally in your first language that it might seem hard to believe that you actually need to teach these skills in a second language. Natural or not, these two skills are exceedingly complex, and each demands special approaches and techniques. This lesson will look at how these skills differ, and then will examine ways to help students improve their listening comprehension and speaking abilities. The majority of English learners around the world need to learn reading the most, yet this skill is probably taught the least. Lesson 9 will look at different writing and spelling systems, the problems that come with the irregularities of English, and different types of reading skills. This lesson will also examine teaching techniques like skimming, scanning, and transcoding that can help students improve their reading comprehension and speed. Millions of people around the world can speak perfectly well but can't read or write in their own language. A person needs years of schooling to develop strong writing skills—and it's even more challenging to learn to write in a second language. So Lesson 10 will review the characteristics of good writing, and you'll get some ideas about how to make learning this skill a little less daunting for your students. Have you ever met a student who really likes to take tests? Probably not. And with all the work that goes into them, teachers like them even less! Yet you constantly need to assess, evaluate, and test to know what progress your students are making and where they may need help. In this lesson, you'll learn the key difference between mistakes and errors, get some ideas about how to offer correction, discover different types of tests, and see how to keep them fair, accurate, and relevant. In the final lesson you'll explore how to become more reflective and effective teachers. You'll learn how to become more expert and efficient, and you'll discover ways to gain insight into your vocation through watching and learning from other teachers, observing and evaluating yourself, and journaling. Finally, you'll see the great value in continuing your professional growth, becoming the great teacher you were meant to be!